This rustic Italian dish originated in Tuscany and dates back to the 1600's if you can believe it! It is simple and delicious and it is perfect for those hot summer days(I know I'm a bit late but oh well...still amazing!). It's fresh and light but still hearty enough to make a wonderful lunch or dinner. It has many variations but for the most part it's base ingredients seemed to always be the same no matter how many of my Italian cookbooks I looked through. This recipe is also another one of those recipes that likes to show off the beautiful colors of the Italian flag. White from the bread, red from the tomatoes and onions, and the green from the basil and cucumber are all happy to make up the Italian color trio. I've made this recipe with the basic ingredients I saw most when researching different ways to make it but with my variation on the bread. Below I have written some of the types of add-ons so that you can play around with it as you like. I have also added the more traditional way of the bread preparation. 1 cup fresh basil leaves, torn into small pieces. 1. Slice the bread and drizzle with olive oil. Grill or toast in oven until lightly browned. 2. Tear or cut the bread into bite size pieces and place them into a bowl. 3. To the bread, add the tomatoes, cucumber, onion, and torn basil. 4. Mix together the olive oil and vinegar. Pour the 2/3 of the dress over the salad, sprinkle with salt and pepper and toss well to coat evenly. Taste. Add additional oil and vinegar mix, salt, and pepper as desired. The dish can either be eaten right away or let to sit for 30 min to 1 hour depending on taste. Drinking wine during preparation and the eating this salad is definitely recommended! 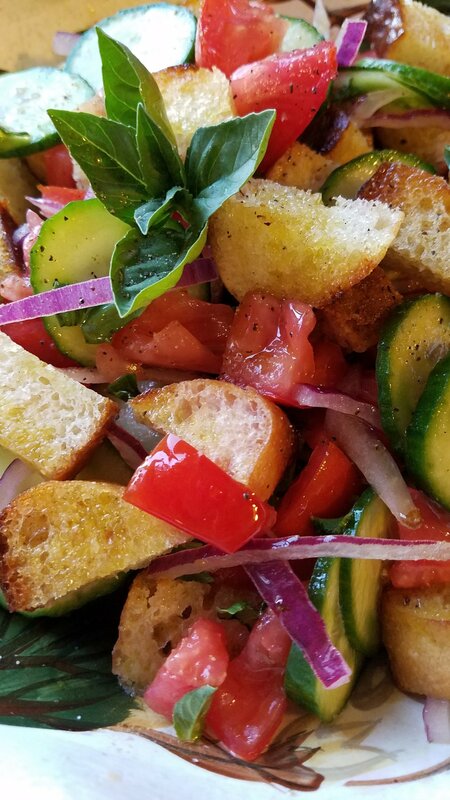 The bread - This is probably the most important part of this salad...after all, it is a bread salad :) It needs to be a crusty country bread, stale or day old and if you want to take it one step further towards the traditional method, you can use the salt-less Tuscan bread. The bread that I used in this recipe and in the pictures was fresh bread. I grilled with olive oil to toast it up a bit and give it some texture. Traditional Bread Method - Slice your day old or stale bread and place the slices in a bowl. Sprinkle with water. Let it sit 15 -30 min depending on how stale it is/was. Squeeze out any excess water and wipe the bowl dry. Tear or cut the bread and return to the bowl. Start at step 3 of the recipe above. 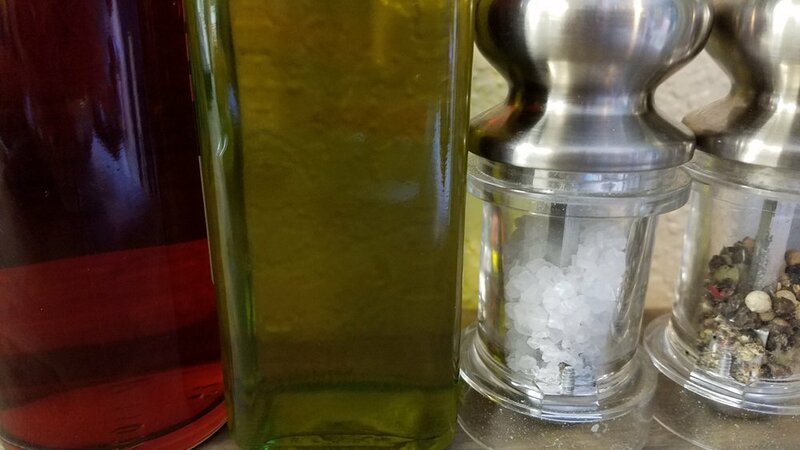 Add-ons - If you like a little extra salt you can add olives, anchovies, and or capers. If you would like a little extra crunch you can add celery, peppers and or fennel. If you would like to add a little protein you can add mozzarella, hard boiled eggs and or shrimp.